Preheat oven to 350F and coat 9" pie plate or glass baking dish with cooking spray. With mixer, beat eggs with sugar until mixture is light and fluffy, about 5 minutes. Beat in the pumpkin until well blended. Mix in the remaining ingredients and combine well. Pour batter into prepared baking dish and spread evenly. Bake for 40-45 minutes or until cake tester inserted comes out clean. Allow to cool then frost with your choice of icing; dust with finely grated chocolate if desired. Beat cream cheese and butter until creamy and well combined. Add powdered sugar and vanilla; taste to adjust for more sugar if desired. Beat cream with sugar until soft peaks form. Add vanilla and liqueur and continue beating until stiff peaks form. Admittedly, this story comes from a woman whose heart is really not in Halloween. Having said that, her heart revels in the joy of autumn baking, which happens to include quintessential pumpkin and ... Halloween. As promised, this is the perfect time to share a favorite pumpkin recipe. 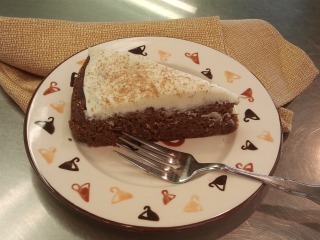 This one is truly delicious and so easy to make, plus there are two options for frosting and both are sublime. In the photo you'll notice that the icing has finely grated chocolate on top which is highly recommended! In the event that you like pumpkin but baking is not your thing, don’t despair. Between you and me, I am nearly obsessed at the moment with pumpkin-spice pancakes and pumpkin French toast with apple syrup on weekend mornings. Both are beyond-pleasurable ways to celebrate the season! If you’re an absolute purist and must use only fresh ingredients, you’ll want to use a sugar pumpkin, sometimes called pie pumpkins or even sugar pie pumpkins. Our friends at Farm Fresh at the Original LA Farmers Market nearly have their own pumpkin patch; Armando and his beautiful crew will help you choose the right one! Trader Joe’s also has Fairytale Pumpkins which might yield enough pulp to bake for the village. Find tips on making fresh pumpkin pulp here. Make sure you have all ingredients before baking. This recipe includes a few must-haves, and it’s so inconvenient to have to run out mid-process and get whatever is missing. Careful to purchase canned pumpkin, not canned pumpkin pie mix! Trader Joe’s Triple Ginger Snaps are wonderful for this recipe. Or, make them fresh with my semi-famous recipe; just be sure to bake them til crispy as you need to crumb them for this recipe. Listen to your favorite music, sportscaster, or cartoons while baking. Nothing terribly serious or disturbing going on in the background, please. Most important: don’t forget to smile while you think of everyone who is going to love this cake when it’s set before them.